After a crazy opening hour at Padraig table that saw him knock out no less that 3 players, and chip up to chip leader. Of all the hands the best one was when the player on the cut off raises Padraig’s big blind, with out looking at his hand Padraig shoves his whole 45k stack at the inistial raiser. The guy insta-calls and shows his Aces, Padraig turns over his 7-3 off. The flop comes 6-6-5 turn 4 river 10 and Padraig moves up to about 80k. 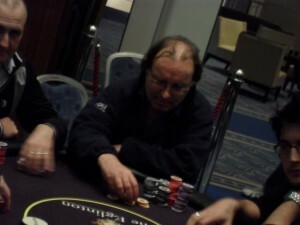 He also managed to get his chips in again soon after with K-K against Q-Q pre-flop, and the Kings hold. Padraig FTW. This entry was posted on Saturday, December 12th, 2009 at 12:00 pm and is filed under Poker News. You can follow any responses to this entry through the RSS 2.0 feed. You can leave a response, or trackback from your own site.